Chicago Review Press, 9781613736173, 240pp. More than seven years after his death, Michael Jackson continues to fascinate the world. Shana Mangatal was one of Jackson’s constant and true rocks of stability for nearly two decades. Their relationship was quiet and sweet and real—a closely guarded secret known only to a few trusted employees and friends. Shana is now coming forward to tell their love story. Sometimes strange, sometimes surprising, always fascinating, this is the story that Jackson fans have been waiting for. During her seven years working for Michael’s personal manager during the prolific period of the 1990s, Shana witnessed the scandals and the lawsuits, the release of groundbreaking albums and the subsequent world tours, the making of big-budget short films, and the addictions. It was through this business relationship that their trust and love for each other grew. Shana kept a meticulous diary throughout it all. Her story is rich with every little detail. Michael and Me entertains and inspires, but above all, Shana continues to treat Michael (and his legacy) with respect. 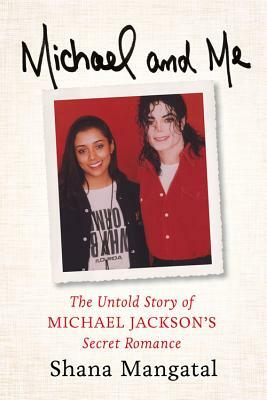 This is not an exploitative tell-all but rather a book that shows the side of Michael people never knew. In it, Shana paints a more intimate picture of this beloved yet very misunderstood man. Shana Mangatal has over twenty-five years of experience in talent and sports management, public relations, music, film, and television. She has worked with Michael Jackson, David Copperfield, Magic Johnson, Boyz II Men, Ruben Studdard, Dolly Parton, Dwight Yoakam, and other entertainment legends. She has also appeared in a variety of films and television shows, including House Party, Hairspray, Family Matters, A Different World, Fresh Prince of Bel-Air, Martin, and two of Michael Jackson’s short films. She lives in Los Angeles.